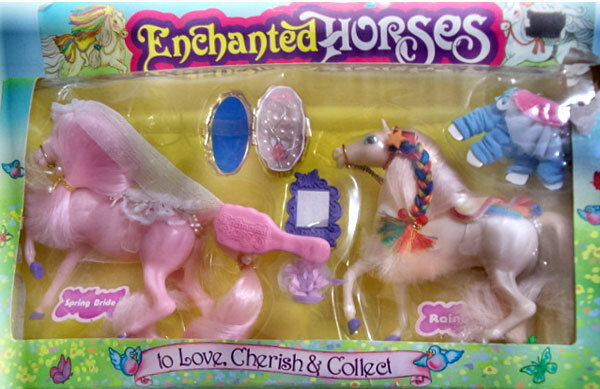 "To love, cherish and collect!" 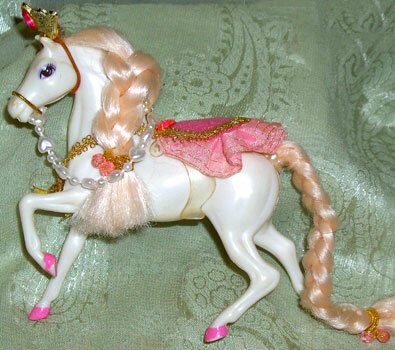 Images on this page thanks to Pablo, Wystearya, RedZedAutobotProwl, and eBay sellers everything-barbie, gthemasterj & itsperfectlyimperfect! 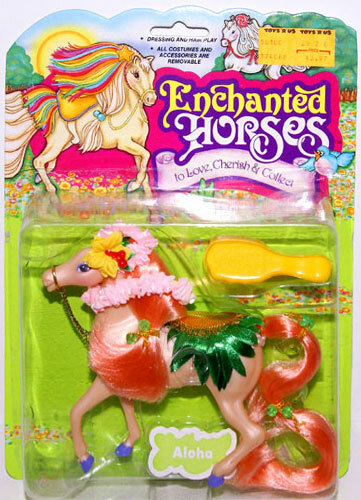 "The Enchanted Horses combine little girls' love of horses with traditional hair and costume play in a fantasy style that makes play more fun. 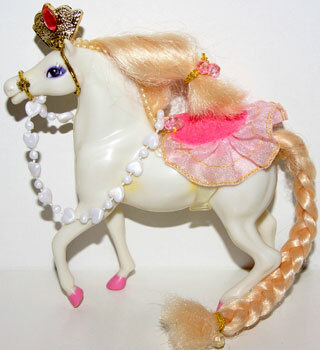 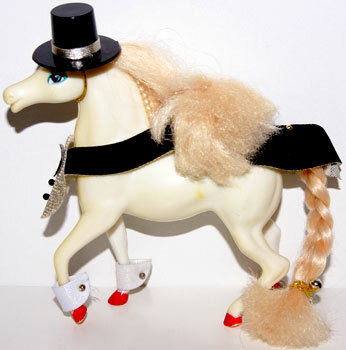 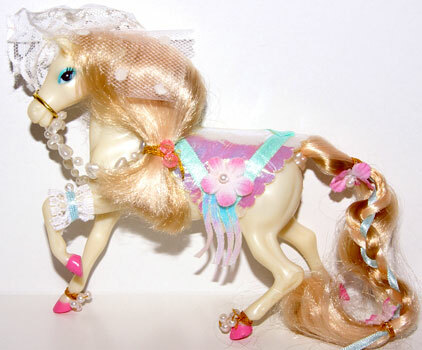 Each Enchanted Horse has its own unique personality created by a fantasy costume with dress accessories that can be removed, mixed and matched. 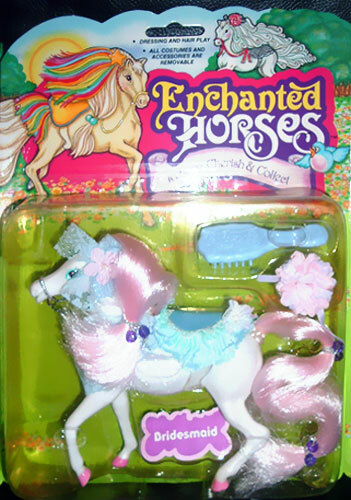 Plus ponytail holders, brush and much more." 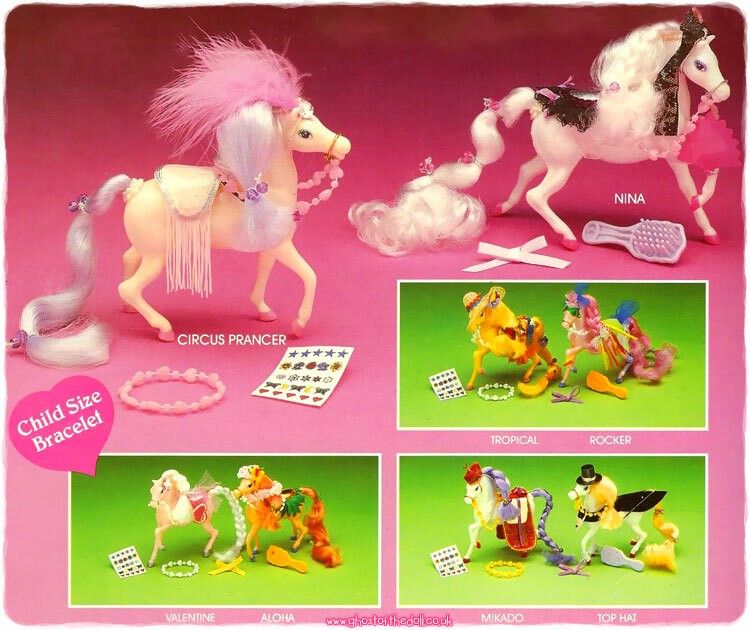 There were at least sixteen different horses sold separately and in pairs, and two different poses. 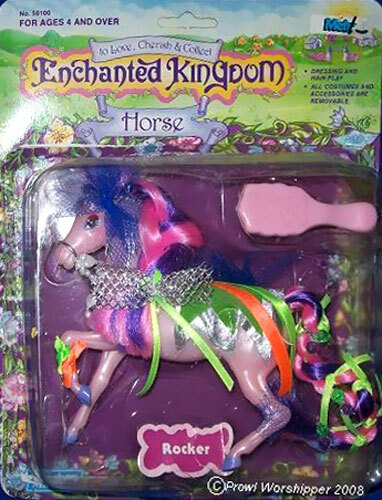 The original release in 1984 had metal chain reins, whilst the second release in 1987 had beaded reins (which most of the loose images are of). 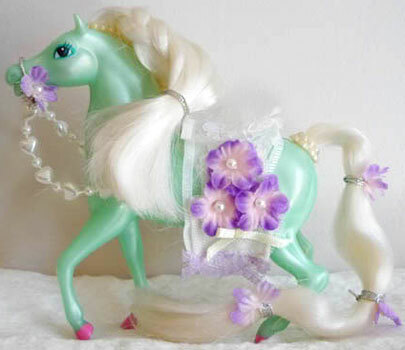 Four of these horses were also sold with new baby ponies in sets of two on their second release (Allegra, Rose Princess, Rainbow/Gypsy & Spring Bride/Springbride). 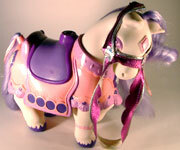 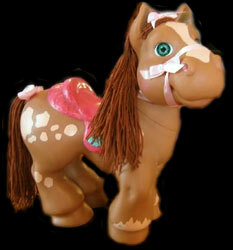 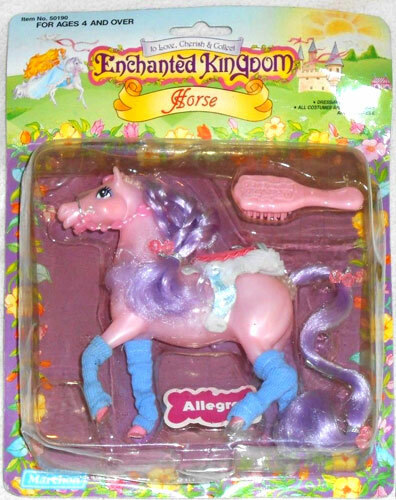 Allegra was also sold in the Horse & Pony set. 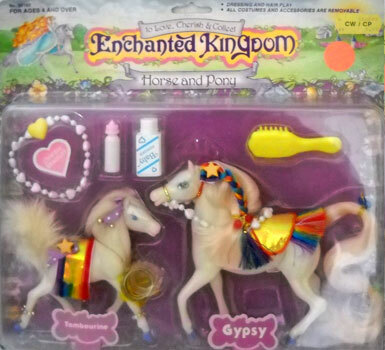 For more information on this set see Horse & Pony Sets. 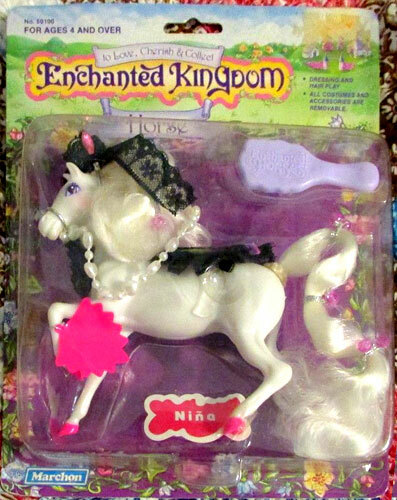 The original Marchon version had pink hooves, sequins and beads, where as the 1995 Empire version of Nina had red hooves, sequins and beads. 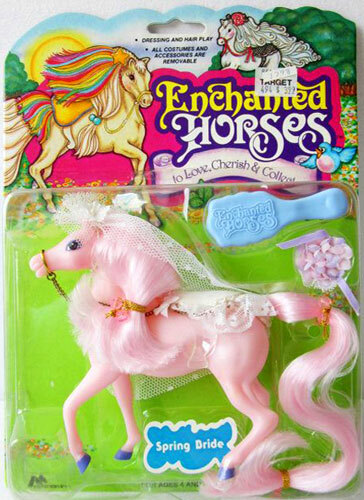 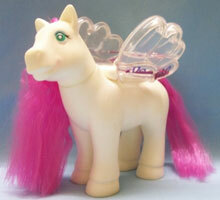 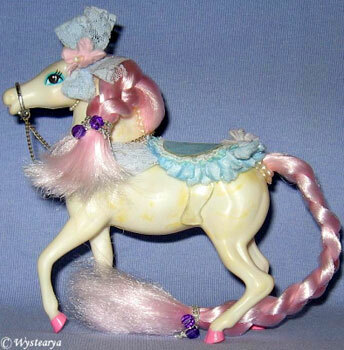 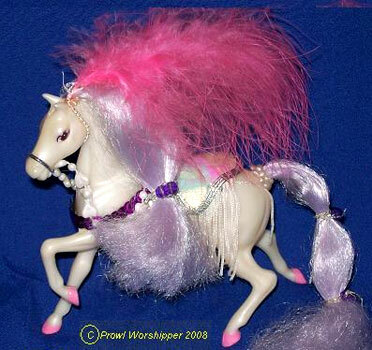 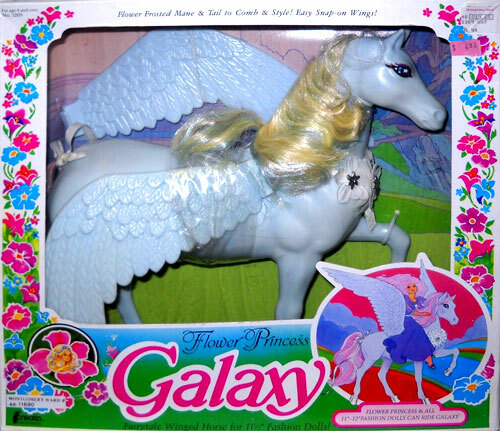 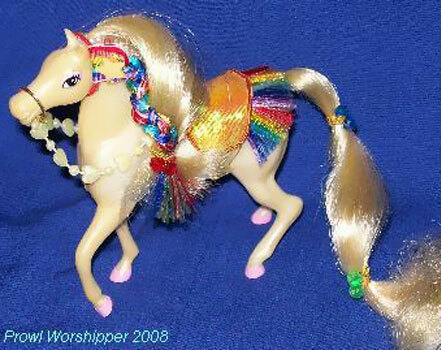 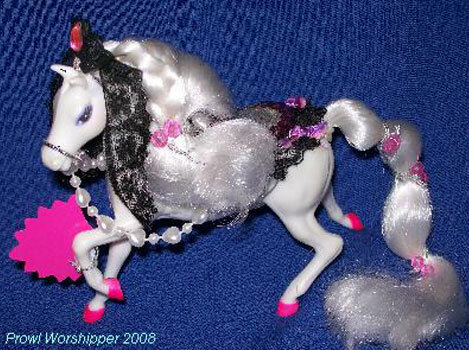 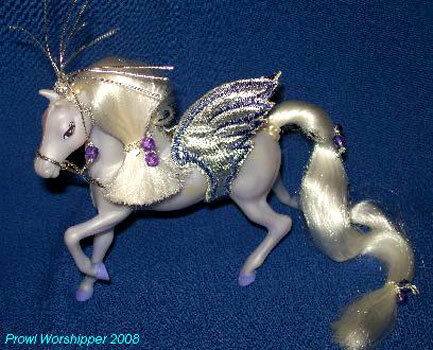 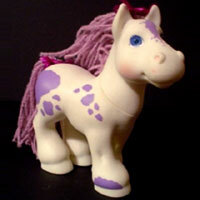 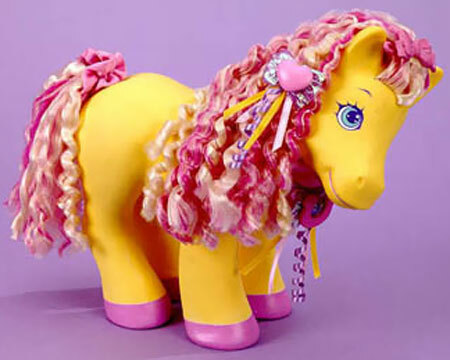 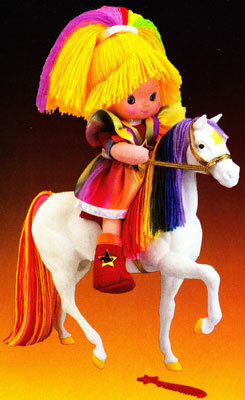 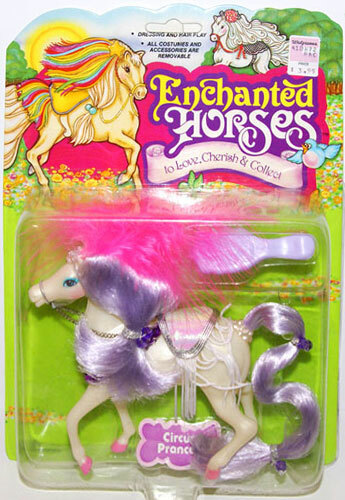 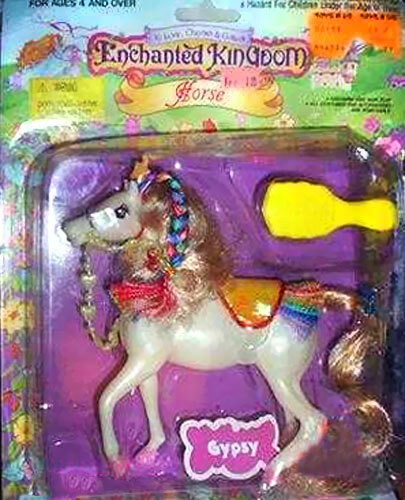 Rainbow was later sold with the name "Gypsy", and also sold in the Horse & Pony set. 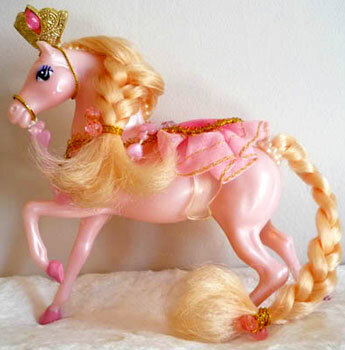 There are at least three body versions of Rose Princess. 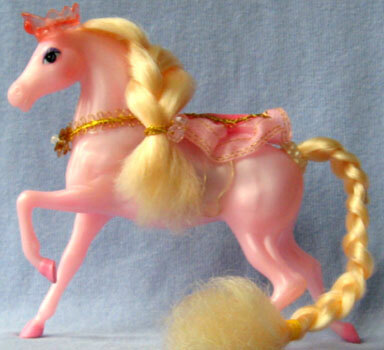 1st & 2nd release have a raise left leg, whereas the "Horse & Pony" version had the slightly bent front left leg and raised head. 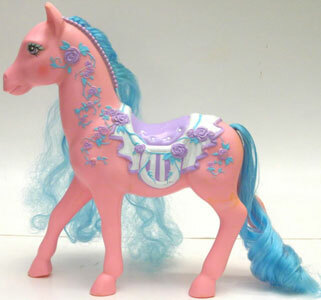 There is also a pink-bodied version, which looks just like Sparkle from the "Sparkle n Speak" set (apart from their different crowns). 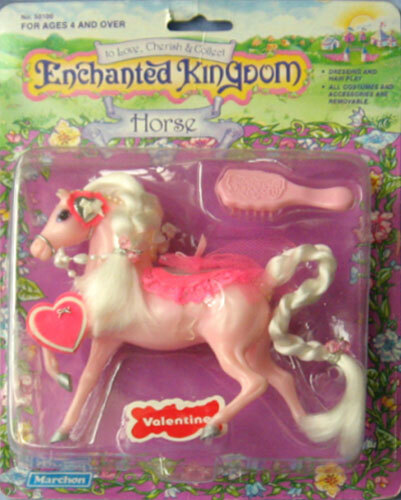 I think the pink version may be by Empire 1995, but only packagin will confirm this theory. 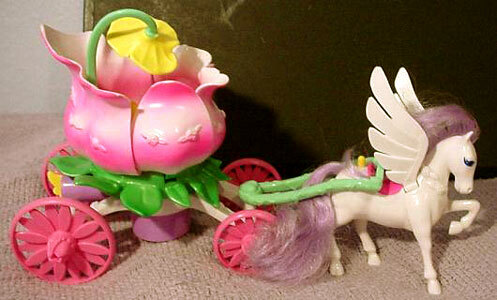 Rose Princess [1995 Empire version?] 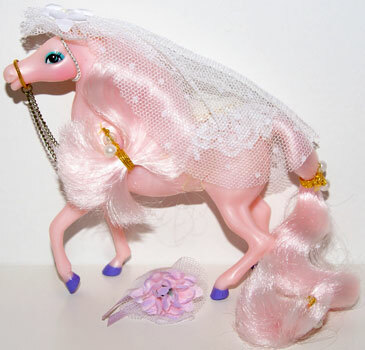 Sparkle from "Sparkle n Speak"
Spring Bride was also sold in the Horse & Pony set, where the spelling of her name changed to Springbride.. 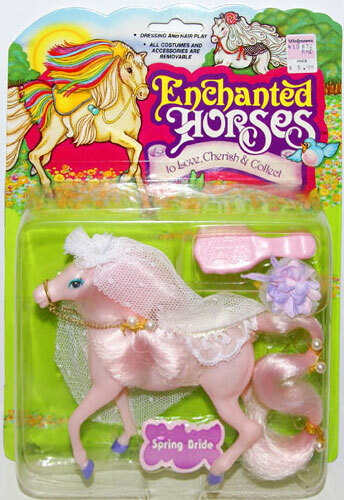 These two Spring Bride horses vary a little in their ponytail holder beads and eyeshadow but are both in 1st release packaging. 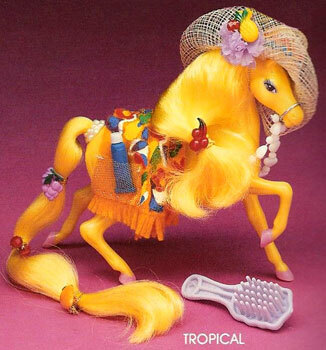 Tropical seems to be one the rarest horses as I haven't found images of her loose or packaged yet. 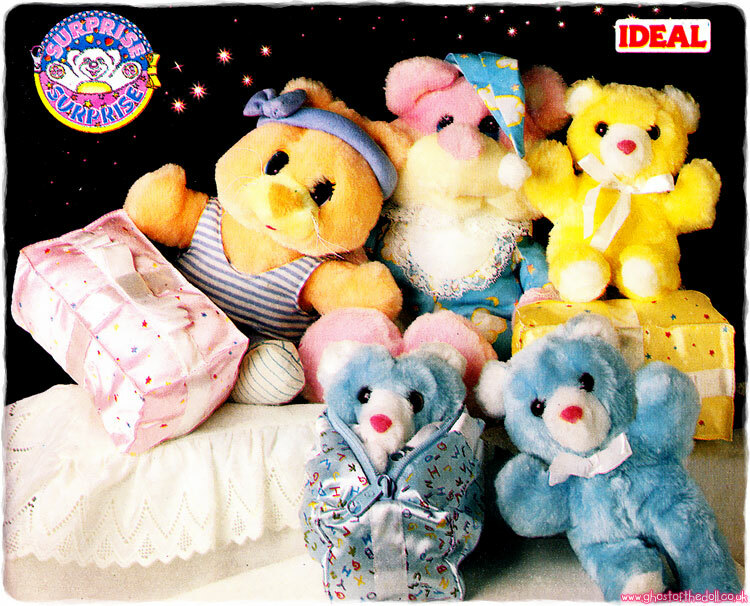 This is from the 1987 Marchon catalogue. 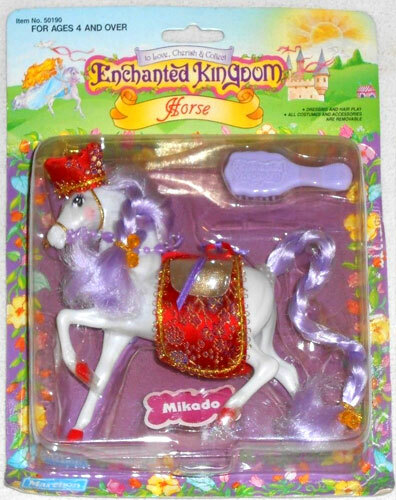 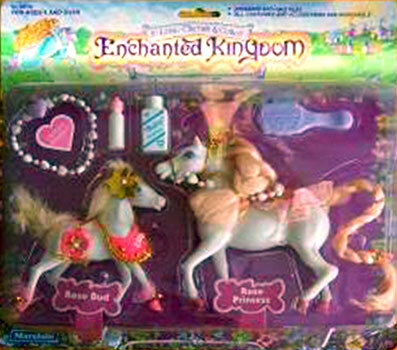 "This exclusive set of two Enchanted Kingdom Horses gives little girls hours of fun plus mix and match costume play. 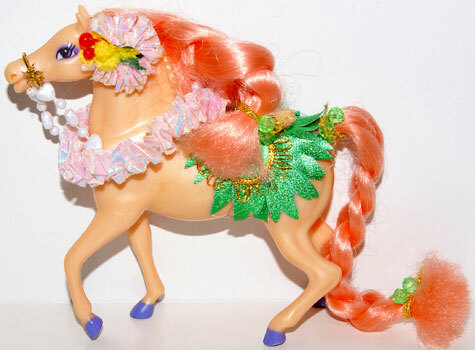 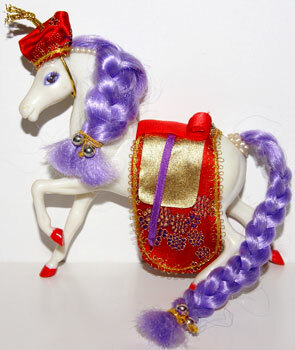 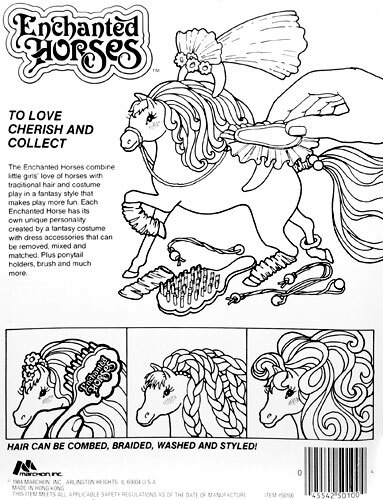 Each Enchanted Horse has its own unique personality created by a beautifully detailed fantasy costume with colour-coordinated long, flowing hair. 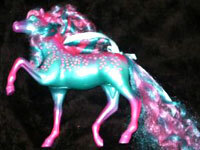 Plus brush, ponytail holders, special child-size bracelet and much more." 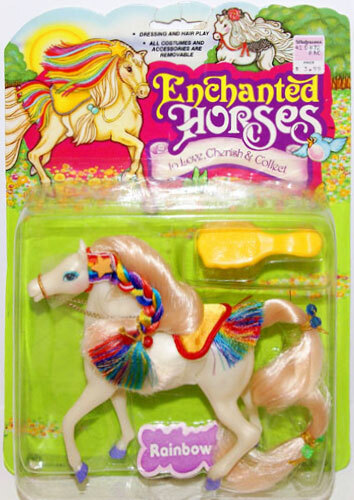 Single horses were also sold in twin-packs in both 1984 and 1987 ( I have found 1st and 2nd release packaging). 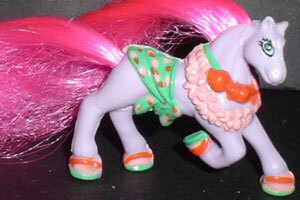 Possibly all sixteen ponies were sold in pairs, but I have yet to confirm this. 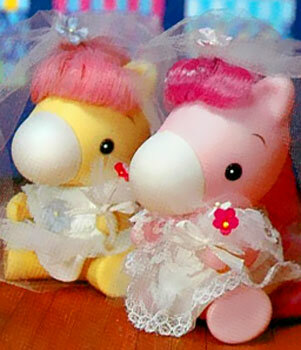 1st release pairs seem to have come with more accessories than the 2nd releases, looking at the "Spring Bride & Rainbow" set below. 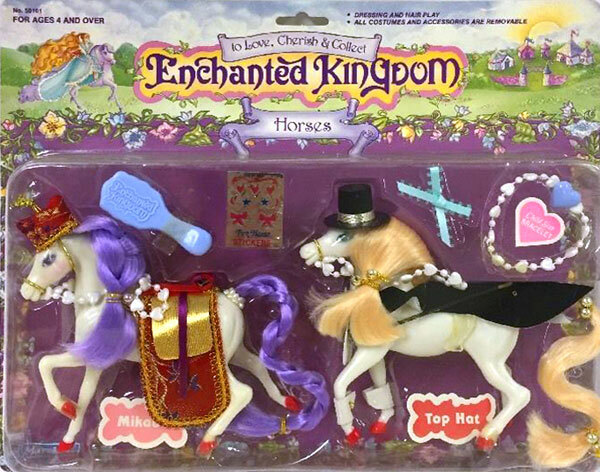 Along with each horses own costume, the 1st release sets look to have come with one extra costume, one brush, a mirror, jewellery box (metal?) 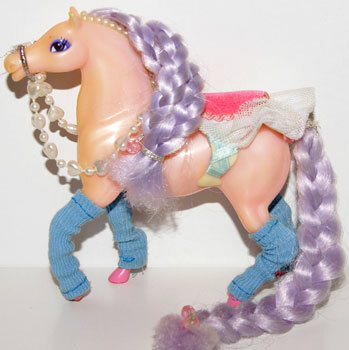 and a child-size bracelet. 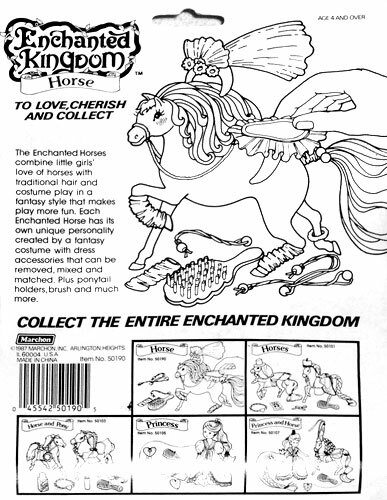 The 2nd release sets came with one brush, a small sheet of stickers and a bracelet. 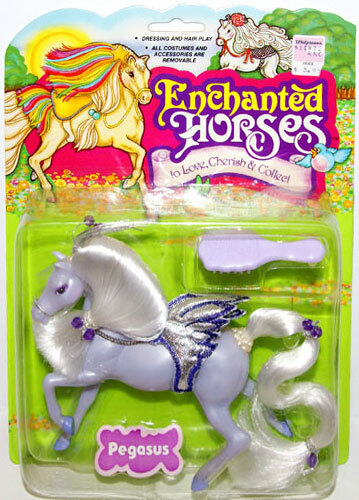 These second release ponies have the original release metal chain reins in the top image, and plastic reins in the image below. 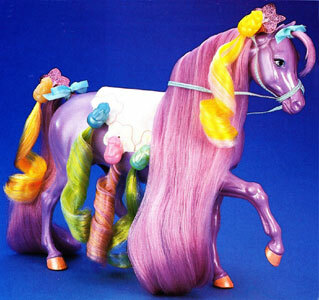 Neither of these two ponies were shown in the 1987 Marchon catalogue, but were still released with plastic reins. 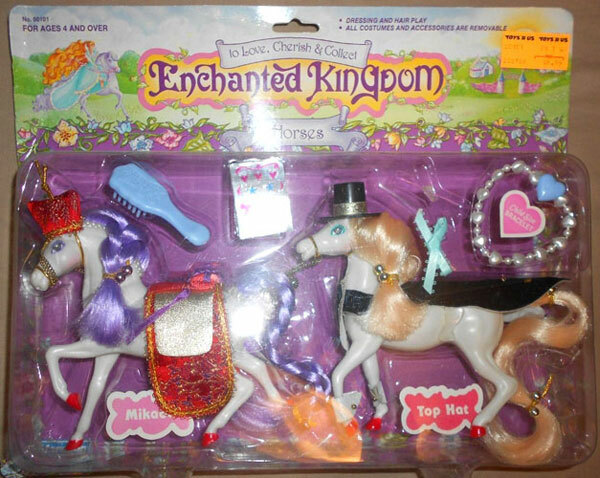 In their second 1987 release, they were called "Enchanted Kingdom", with "Horse" underneath on a blue scroll. 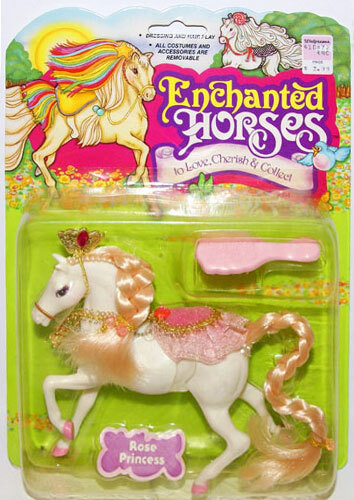 There is also another style of packaging dated 1987 which has a yellow scroll with "Horse" underneath. 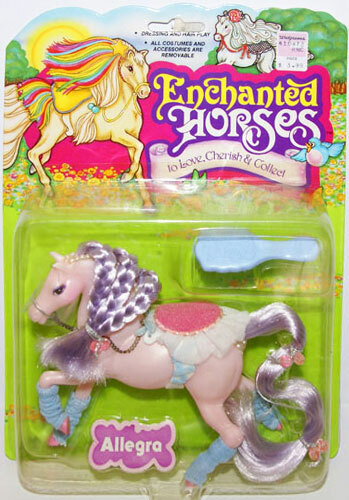 As the last sets from 1991 also had this style I assume this is a third release. 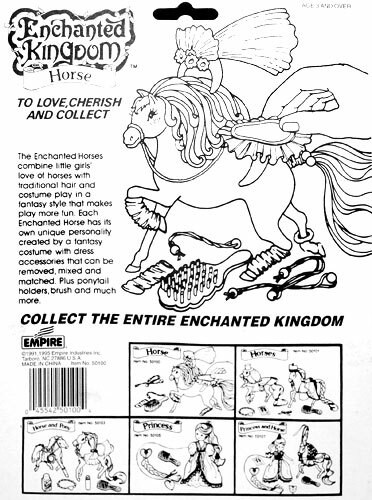 The yellow scroll version was used by Empire when they re-released the line in 1995. 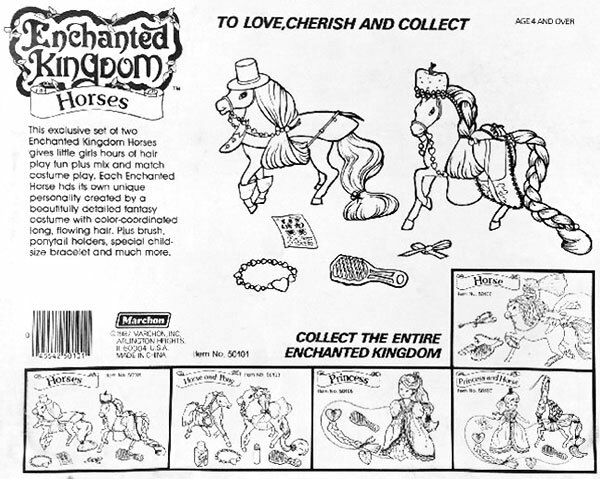 This is the back packaging from the 1st and second releases. 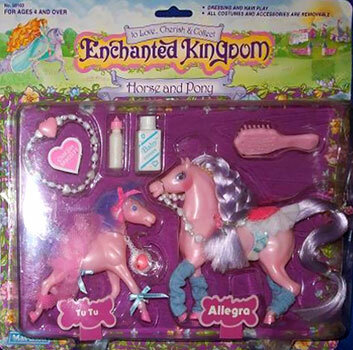 This back packaging is dated 1991, 1995 and produced by Empire. 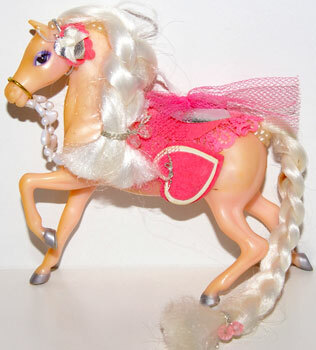 "Enchanted Horses combine every little girl's love of horses with traditional hair and costume play. 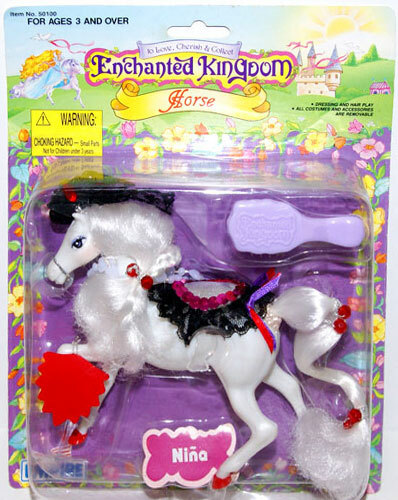 Each of the 8 Enchanted Horses has a unique personality accented by colourful fantasy costumes that now include beaded reins in fanciful butterfly or heart shapes. 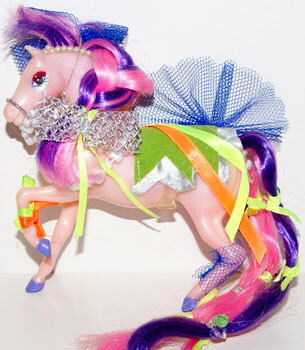 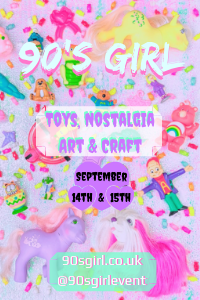 Costumes and accessories such as ponytail holders, brushes and more con be mixed and matched for hours of fun and enchantment. 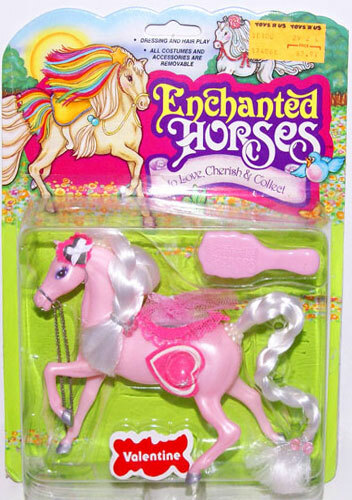 A real collectors item." 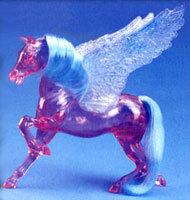 The 1987 Marchon catalogue featured only eight horses, but I have found others with plastic reins not featured. 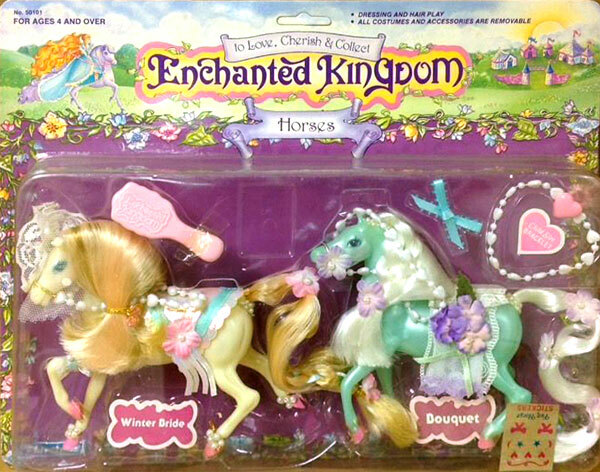 "Enchanted Horse collectors will enjoy collecting the Enchanted Horses specially offered in this new twin pack. 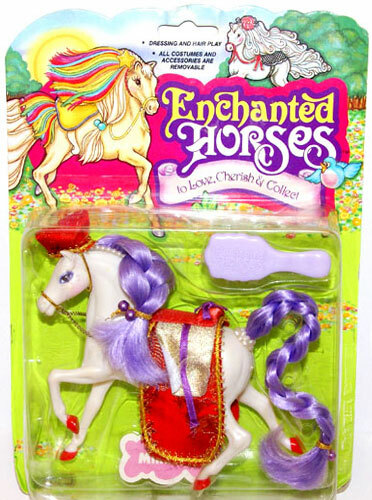 Each Enchanted Horses Value Pack includes beaded reins and matching child-size bracelet, grooming brush, and a ribbon bow, plus a sheet of colourful decals in fanciful shapes for decorating the horses." 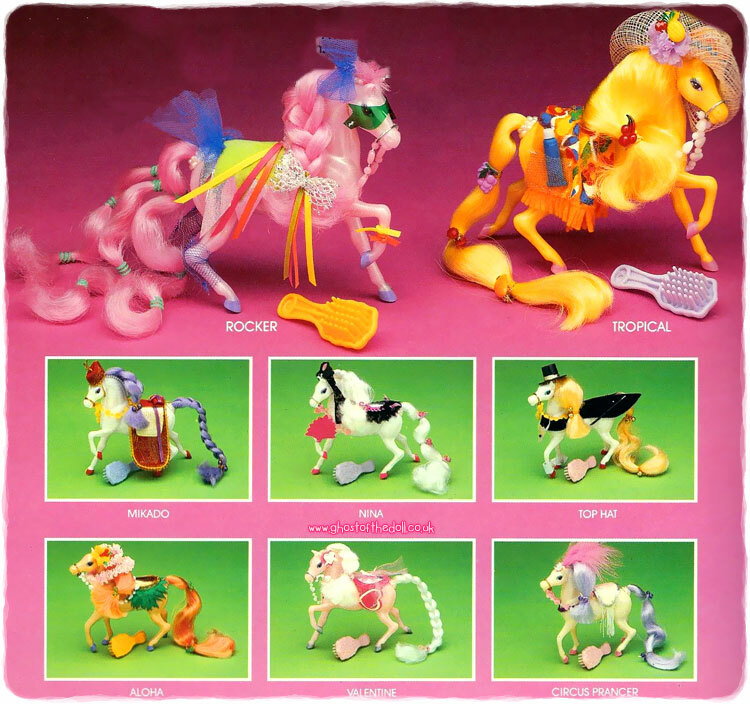 The 1987 Marchon catalogue featured only four pairs of horses, but I have found 2nd release packaging for others not featured.